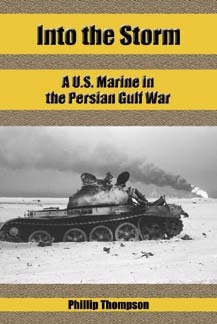 Upon receiving my copy of this book, I figured that it would be another quick review of a book related to Desert-Storm. This book has turned out to be all that and more. "In three notebooks, Thompson wrote down everything he could, drawing maps, explaining his emotions, and oftentimes venting his anger. Upon his return he transformed them into this memoir, the hard truth about Operations Desert Shield and Desert Storm." Phillip Thompson offers a unique perspective and dialog about the war. A longtime journal writer, Phillip offers a glimpse into the reality that was Operation Desert-Storm, through his writings. This is a welcome change from the TV war commentaries I often encounter. The author expertly allows you to associate yourself with him from day one through his journal entries, dating from the Iraqi invasion and his deployment to the Gulf in August 1990. Upon first look, one might be discouraged because this seems like it may just be a journal of another soldier. But it is not. Phillip Thompson follows each entry with a post-event analysis which clarifies and corrects inaccuracies in his write and brings into focus a clearer view of a facet of Operation Desert Storm that is not often mentioned, artillery! This work, along with Steven Manchester's recent book entitled The Unexpected Storm, are taking the story telling of war in a grand new direction. The reader zooms in from the big picture, tactical discussion normally provided and dives right into the trenches, sharing the daily struggles and triumphs that were part of the war, and gets a clearer picture of the humanity of the American military machine, made up of people just like ourselves. Q1: For our readers, with what unit were you deployed, and where were you stationed? At the time of my deployment to Saudi Arabia, I was serving as the operations officer for 1st Battalion, 12th Marines (Reinforced) of the 1st Marine Expeditionary Brigade, which was based in Kaneohe Bay, Hawaii. 1/12 is the artillery battalion that supports the 3rd Marine Regiment. 1st MEB was one of two Maritime Pre-positioning Force brigades designed to deploy on a moment’s notice to a regional hot spot. Our gear was aboard ships in Guam, and we flew to Al-Jubayl, Saudi Arabia, to meet and unload those ships, then move into the desert. Q2: Seeing as there has been much written about Desert-Storm and the surrounding events and times, what makes your book different from other such writings? Many of the books about the war are of the “coffee table” variety – big glossy books with lots of pictures of fighters and tanks. These books usually cover the war from the “big picture” level, that of the four-star generals. Of course, Gen. Schwarzkopf has his own book that goes into his role in great detail. But not many books exist – or didn’t when I began writing mine – that tell what the war was like from the perspective of one guy on the ground. Lost in the yellow ribbons and Tomahawk missiles and TV coverage was the fact that there were nearly half a million men and women just trying to make it through another day. My goal was to capture that feeling and show what the war looked like from the perspective of one Marine in a battalion. Certainly I’d fight again. As a Marine, I didn’t get to pick and choose when and where I’d fight; I followed the orders of my commander in chief. With the 20/20 vision of hindsight, however, it is pretty apparent that when we stopped the war, we left Saddam with enough men, material and willpower to rebuild a force that could menace the region again someday. The several “scares” Saddam has given us since 1991 are proof of that. I’m not saying we should have rolled into Baghdad, but, as if often the case when Americans fight wars, we stopped pursuing the Iraqi Army a little too soon. Another disturbing aspect of the war is the precedent that it set for similar action by presidential fiat. Pres. Bush, in the opinion of some, skirted the constitutionality of his power by forming a coalition and basically going to war whether Congress liked it or not. He had no formal declaration of war, after all. He appealed to the UN and our allies. Since then, Pres. Clinton used a similar approach to involve us in Haiti and the Balkans and numerous other “near clashes.” That, as we since seen, puts the American military in precarious positions when the threat to national security is difficult to discern – not to mention the toll on military readiness. Q4: What are you up to now and what is in the future for Phillip Thompson? I’m currently searching for an agent for my second novel, which is a follow-up to the first, Enemy Within, which was published in 1999 by Salvo Press. That book should be out in audio format later this year. I’ve also begun a third novel, which is actually set during the war, and I’m working on a couple of short stories at the moment. I hope to eventually become a full-time author.